"We have fun and we enjoy each other's company, so why shouldn't we just move in together? "-Lauren, from Cohabitation Nation Living together is a typical romantic rite of passage in the United States today. In fact, census data shows a 37 percent increase in couples who choose to commit to and live with one another, forgoing marriage. And yet we know very little about this new "normal" in romantic life. When do people decide to move in together, why do they do so, and what happens to them over time? Drawing on in-depth interviews, Sharon Sassler and Amanda Jayne Miller provide an inside view of how cohabiting relationships play out before and after couples move in together, using couples' stories to explore the he said/she said of romantic dynamics. Delving into hot-button issues, such as housework, birth control, finances, and expectations for the future, Sassler and Miller deliver surprising insights about the impact of class and education on how relationships unfold. 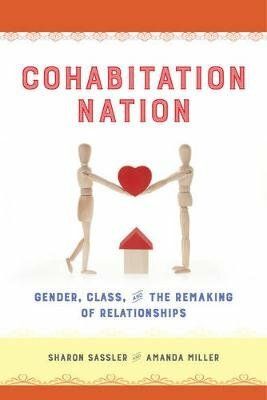 Showcasing the words, thoughts, and conflicts of the couples themselves, Cohabitation Nation offers a riveting and sometimes counterintuitive look at the way we live now.